This delicious Chicken Goujons recipe uses oats rather than traditional breadcrumbs. It's a great way to get children to eat healthier. 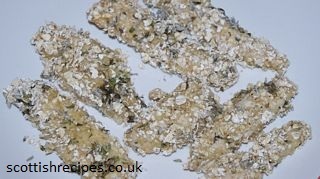 Though the chicken goujons in oats in our photos do not look too appetising they do taste lovely with a wonderful crunch and delicious herb flavour. Cut the breasts into strips length wise, about finger wide size. Mix the chopped thyme and a little garlic grain pepper with the porridge. Dip the chicken into the beaten egg and roll in the oats until coated all around. Place them onto a lightly oiled baking tray leaving space between each one, and bake at gas mark no.5 (190oC) for 20 � 25 minutes until they are cooked through and the juices run clear. Serve with a dip and some salad. We would like to thank Sainsbury�s for this Chicken Goujons recipe and photograph which formed part of their Eat Britain campaign. To read more about it visit the Scottish Cooking And Recipes From Scotland page.